Although we are primarily known as an Austin web design company, Pallasart has being selling decorative art and furnishings for many years. This business started online in 1997 and expanded to a retail store in the decorative center in Dallas. In the last few weeks we have added some new bronze sculptures to our collection that are now available for order. 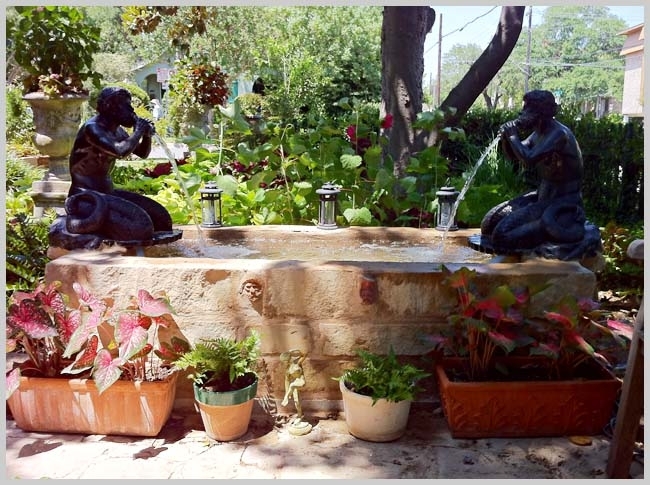 Left: Artemis Diana in the garden on Laurel Lane in Austin. A year ago we conducted an extensive search for two new models. We were looking for a sculpture of Diana and a new fountain figure. Diana is the Roman name of the Greek goddess Artemis, who was the goddess of the hunt, wild animals, and the wilderness. The deer and the cypress were sacred to her. Artemis was also known as Selene, goddess of the Moon. According to legend, the god Pan gave Artemis two black dogs. As some of you know 101 Laurel Lane is named the Palazzo Dei Cani Neri - the House of the Two Black Dogs. 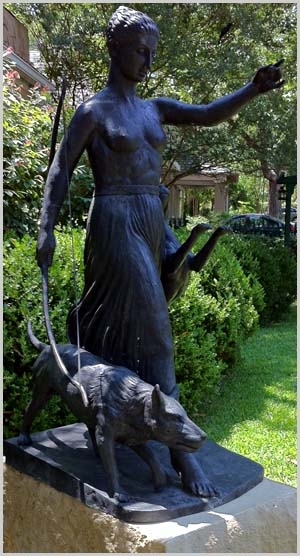 We wanted to create a statue of Diana with dogs to match the name. You would think there were many figures of Artemis Diana to choose from, but our long search showed fewer than we had expected. We looked seriously at the famous Diana of Versailles, which is in the Louvre; and the Sackler Diana - "Artemis and the Stag" - which a Buffalo art museum sold for a record $25.5 million in 2007 at Sotheby's. Both of these had stags but no dogs. The Louvre Diana is beautiful, but I felt it is too well-known. It isn't a trite image, but it's the selection one would expect. We wanted something rare and unique. Artemis and the Stag is really cool and we could have easily added two dogs, but there was something cold, even icy, about it. We eventually found the sculpture of Diana and the Hounds by William Leslie Bowles. I had never seen it before. It sits in a lily pond outside the Melbourne conservatory in Fitzroy Gardens, Melbourne, Australia. The original was created in 1932 but the statue was not cast until 1940. This figure seemed perfect. It was life-sized and had the two dogs we were looking for. The figure was art deco in style. The hair was crisp and wavy, and the goddess has her left arm extended - she has just release an arrow from her bow, which she has lowered to side. Right: The clay model in the foundry. We sent huge images of the statue from all angles to our foundry where our top sculptor (an amazing man) who then created a life-sized model in clay. Once we approved the model a mold was created from which a wax was pulled. This wax was then cast in bronze (the lost-wax process), finally the surface was finished and a dark patina applied. Most people don't realize that patinas are always applied to bronze statues to protect them and to add artistic value. Finally our statue was crated and sent by ship to Los Angeles. From there Artemis Diana was trucked to Austin where we had her placed on a huge base of Texas Lueders limestone. Already the statue is showing some weathering which is adding some beautiful green ro the surface. Next time we will probably used DHL for shipping. It is much quicker and door-to-door. The cost of DHL is probably around $900. We also just added a new Merman fountain figure. The original is from a fountain in the Piazza Navona. La Fontana del Moro (the Moor Fountain) is a located at the southern end of the square. The fountain was originally designed by Giacomo della Porta in 1575 with a dolphin and four Mermen (also called Tritons). In 1653, the statue of the Moor, by Gian Lorenzo Bernini, was added. 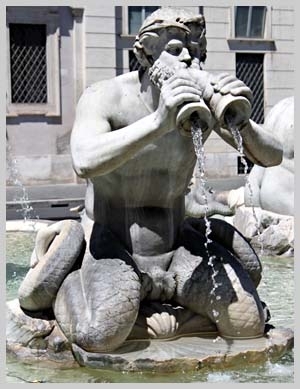 In the fountain are placed four Triton Merman, two with beards and two without. The Mermen have crowns of seaweed and two curled fish tales in place of legs. They are seated on shells and blow water from paired shells. 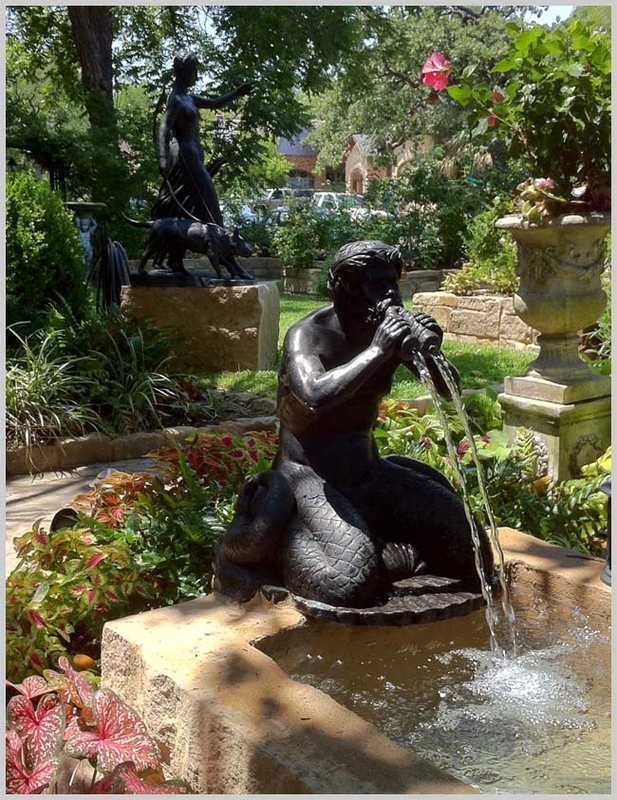 Above: The sculptures mounted on a limestone fountain in the Laurel Lane garden. The lanterns are from Restoration Hardware. At the base are caladiums and Autumn ferns. In the center is a small of bronze of Venus removing here sandal from Pompeii. Behind the fountain are planted native Texas Hibiscus. We sent pictures of the originals to the foundry and had replicas made that are 21 inches tall. We had the same dark patina put on them to match Artemis Diana. Here you can see them mounted on a limestone fountain here on Laurel Lane. The mermen are quite amazing, with beautiful fine details. It is impossible to find fountain sculptures like this today, no one is making them, which is one of the reasons we commissioned them. Left: The original marble sculpture in the Piazza Navona in Rome, Italy. We shipped the mermen via DHL and they took four days to arrive. The shipping cost was around $200 per figure. 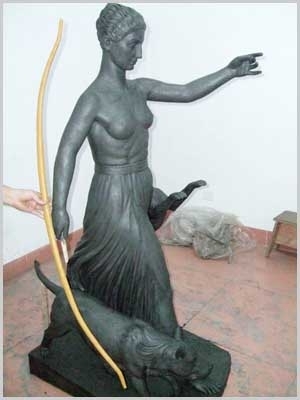 If you are interested in a cast of the life-sized Artemis Diana in bronze the cost is $7,200. Shipping is additional. It takes around 4 weeks for your cast to be completed. Shipping is additional. The Mermen are $3,000 each and take the same length of time to cast and finish for shipping. Please contact me for more pictures or exact information on size and weight of the figures. Pallasart also takes custom orders for bronze and marble sculptures. Call or send us pictures along with the size you would like for a quote. Below: A large view of the sculptures in the garden taken a few days ago.